One of the first things you’ll notice about this ride is the lack of traffic. In fact it’s mostly on roads that nobody else seems to know exist. Mostly two lanes, paved and the perfect mix of sweepers and twisties with just enough straight stretches to let it go. Total distance for the ride, 350 km and a map can be found at the end of the blog. 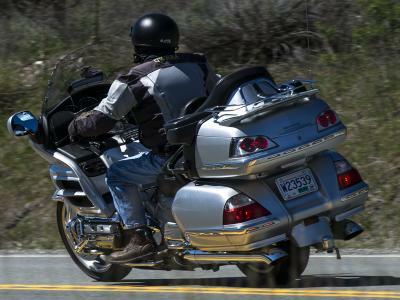 You’ll be riding along side a clear mountain creek past a few lakes, through some high country mesa, sandstone cliffs, ranchland, a few small towns (pubs, restaurants, gas) and even a chance to stop at a local cider brewery. Towards the end, when you are following the famous Thompson River, you’ll be on Highway #1 but even then, most if it will be on two lanes. And speaking of roads, if you’re a dual sport biker you will be passing a lot of forestry roads, so bring your GPS and do some extra exploring. I just did this ride May 6/16 with morning temperatures around 15’C (About 60F) and late afternoon temps that were closer to 30’C (High 80’s in Fahrenheit), so expect to end the day in a T-shirt. Heading west out of Kamloops on Highway #1 towards Savona, you’re going to turn left onto the Tunkwa Lake Rd just before entering Savona (about 43 km from Kamloops and well signed). This road is paved but a bit uneven in places. However, the scenery is spectacular and the turns and climbs make it all worthwhile. Your next major junction is only 40 km away, so take your time and enjoy.After riding through the provincial park, you’ll arrive at the Logan Lake junction and you want to continue straight ahead on 97C. Unless you’re hungry or need gas in which case hang a left into Logan Lake. I recommend the Black Bull Pub on Poplar Dr. if you’re looking for lunch. Back on the road and heading south on 97C, you’ll see Left Field Cider on your right. I wasn’t much of a cider fan until I stopped their last summer and learned what real cider should taste like. I now enjoy cider and I recommend you stop as well. Merritt is a ranching community and I’d recommend heading downtown for a visit and maybe something to eat. They’re known as the Country Music Capital of Canada and you might want to visit the Canadian Country Music Hall of Fame. Back on the road, you’ll be heading west towards Spences Bridge on 8, following a valley carved out by the Nicola River. 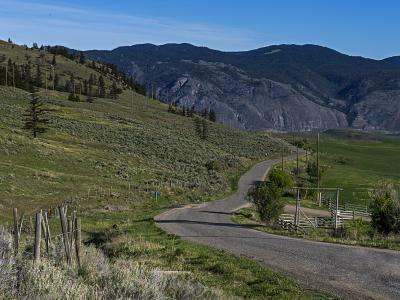 It’s two lanes all the way and you’ll be riding by grasslands, pine forests, semi-desert sagebrush country, sandstone cliffs and the clear running water of the Nicola. There’s parks and recreation sites along the way, so lots of chances to stop and explore the countryside. Mind you, the road seems to have been built for bikes, so you may not want to stop. It’s around 65 km to Spences Bridge and some say this is the best part of the ride. Once you’re in Spences Bridge and just before hitting the junction of 8 and Highway 1, look up and to your right and you’ll spot the tallest waterfall in the area. Turning right onto Hwy 1 you’re on your way to Cache Creek. It’s 50 km away and the road is in perfect shape…Mostly 2 lanes but long passing lanes on the hills. You’re now following the historic Thompson River and the highway you’re riding on began life as part of the Cariboo Gold Rush trail. 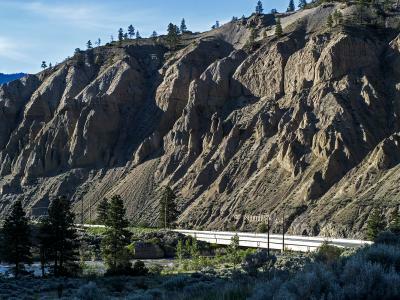 As you near Cache Creek and start your decent into town, the speed limit drops to 70 km/h and then quickly to 50. It’s a well-patrolled section of highway…just saying. From Cache Creek, it’s 45 minutes to Kamloops on Hwy 1 and again, mostly two lanes with lots of passing lanes in the hilly sections. If you’ve timed this last part of the ride right, the sun will be on your back and beginning to set. Long shadows in the hoodoos beside the road, the tops of the hills lit up, Kamloops Lake eventually appearing on your left and cooling things down a bit as you near the end of the ride. 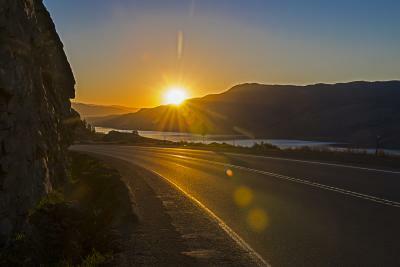 And if you want to watch the last of the sunset happen, stop at the lookout at the crest between Savona and Tobiano. You can climb out on the rock bluffs and watch the sun go down. When you’re back in Kamloops I recommend you stop by the Noble Pig, one of our local brew pubs. It’s right downtown on Victoria St., makes all it’s own beer on premise, has a great scotch bar as well, large selection of wine and menu that insures you won’t go away hungry. If you’re looking for a place to stay that is nearby, check out the Thompson Inn (next door), the 540 Hotel (a block away) or the Plaza Hotel (2 blocks away). There’s also a good choice of motels up on Columbia St that are just 3 or 4 blocks away. So it’s easy to park your bike for the night and enjoy an evening at the Pig. 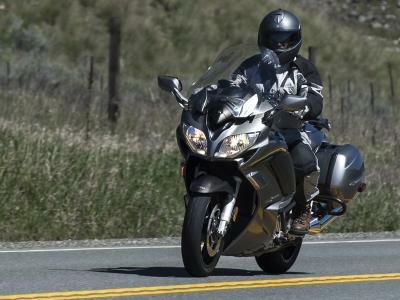 If you’ve decided to stay another day to experience more rides, - something I really think you should consider - then I’ve got another great highway touring ride to tell you about. Or for dual sport riders, there’s an incredible ride that will take you through the Douglas Lake Ranch on mostly gravel roads.